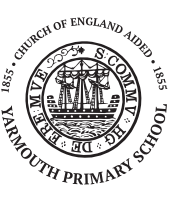 The name of the school is Yarmouth Church of England Primary School. The School is a Voluntary Aided School. The Governing Body of Yarmouth England Primary School is the admissions authority. The School’s trust deed of 1854 states that The School was established to provide education for children living in the parish of Yarmouth St James . This parish and the Local Authority catchment area for The School are referred to as (The Area Served by The School). A map of this area and a list of roads form part of this policy document. This policy has been made in accordance with the School Standards Framework Act 1998, The Human Rights Act 1998. The Equality Act 2010 and the Public Sector Equality Duty. This policy will be administered fairly and impartially. The decision to admit, or otherwise, is the responsibility of The Governing Body. The information given below is correct for the school year shown above, but it could be altered for future years. Parents should check with The School that no changes have occurred. All applications are made by Parents for their child / children. Places will be offered up to the Published Admission Number (PAN) i.e. 15 pupils, regardless of preference. If the number of applications exceeds the PAN, the criteria found in the admissions policy will be used to allocate places.